Google's Chrome took the crown as the world's most-used web browser last Sunday, March 18th. 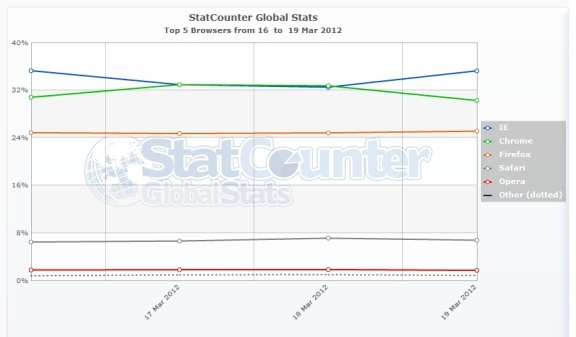 But as the world suited up to go back to work on Monday, Internet Explorer re-gained the lead. So says online service StatCounter, although the service also urges us all to take its data with a grain of salt. That's because while it collects data about 15 billion page views per month from three million websites, it says its results “are subject to quality assurance testing and revision for 14 days from publication. And here, for what it is worth, is a chart covering the last year. This graph shows that Chrome consistently peaks as IE hits troughs. That pattern has been widely interpreted as showing IE as browser of choice on business desktops, while users then go home and use Chrome. 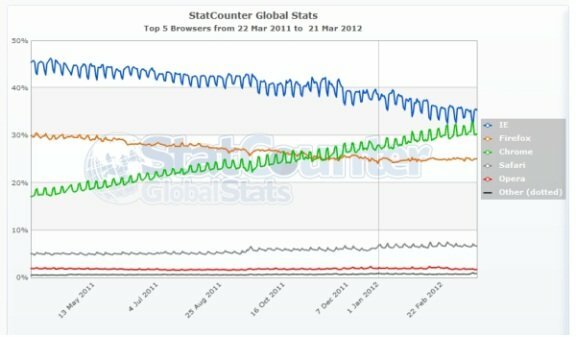 And of course the trend lines also show Chrome catching IE slowly but surely.